Carlos Manuel Haro is a postdoctoral scholar-in-residence at the UCLA Chicano Studies Research Center (CSRC). Retired in 2008 as the assistant director of the CSRC, Dr. Haro served as coordinator of the annual CSRC Latina/o Education Summit series from 2006-2015. 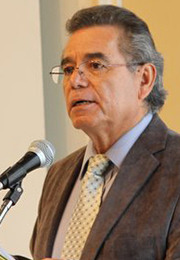 He has also directed a number of other scholarly conferences at UCLA, including “Mendez v. Westminster School District: Paving the Path for School Desegregation and the Brown Decision” (2004), “The Sleepy Lagoon Case, Constitutional Rights, and the Struggle for Democracy” (2005), and “Sal Castro and the Chicano Youth Leadership Conference: The Development of Chicano Leadership Since 1963” (2006). Dr. Haro has published on college admission policies, the Bakke decision, and school desegregation. As a postdoctoral scholar at the CSRC, he undertakes and directs specific education research projects and assists with the research and fellowship programs of the CSRC.